Your roofer might be perfectly friendly, competent and well-intentioned, but roof repair can be painfully expensive. According to Homeadvisor, the average new roof costs $7,522 — and that doesn’t include fixing structural problems you might have. If you have mold, wood rot, or joist damage, or if your roof is particularly steep or you want anything but the cheapest materials, $7,522 won’t get you very far. Roofing isn’t most people’s idea of a good time, but the money you save with a quick DIY roof repair job can make learning the basics worthwhile. Here are some videos to help. 1. What weather is OK for roof work? If you need to install shingles, December isn’t the time unless you happen to be reading this from Florida or Australia. The sealant between shingles will take months to dry unless the temperature is at least 50 degrees Fahrenheit (10 degrees Celsius), and you run the risk of shingles that won’t lay flat. 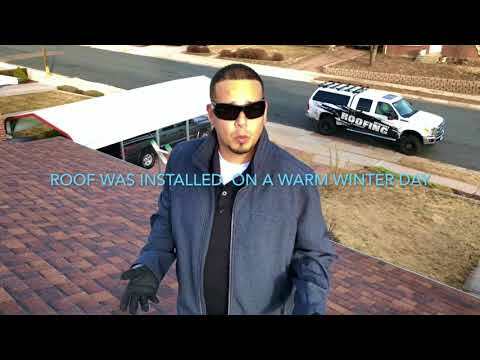 You might be able to get away with roofing in 40 to 50 degrees Fahrenheit, but only if you’re in the tail end of winter and expecting the temperature to keep rising. 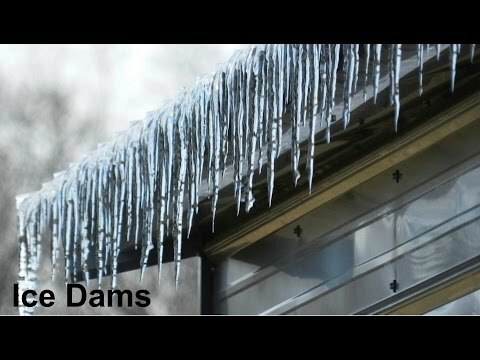 Most leaks that crop up in winter are due to ice dams building up along the edges of your roof. Removing ice dams isn’t a construction job; a roof rake will go a long way toward helping you get ahead of the freeze-melt-freeze cycle. Here are a couple of quick tips from the Canadian Broadcast Company in case you find your home wreathed in icicles. 4. … But if you want to solve the problem for good, you may need an insulation upgrade. We never promised you you’d be able to avoid contractors entirely. Below is a succinct explanation of how underinsulated roofing results in leaks, and why one of the most effective solutions (sprayed cellulose) might be worth the investment if you have persistent dams building up that lead to leaks. If you need to save money, removing and reinstalling walls or ceilings yourself will help defray a contractor’s labor costs, and there are some resources out there to help you spray cellulose on your own, but doing this does require specialized equipment and more self-confidence than we have. You’ll need to remove a little ceiling, but running water over the area will help pinpoint a leak. This is a two-person job; you need one person to spray water and another to keep an eye on the area from below. Shingles mean work. The upside? Unlike a metal roof, you likely won’t need to remove whole panels to fix a problem. 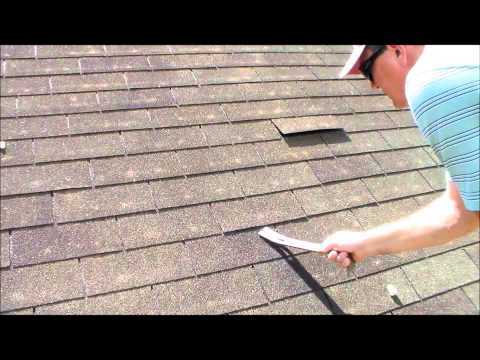 Wait until a dry day and identify the general region of the leak from the bottom, then once you’re topside again in the same area, pry the bottoms of shingles from the bottom, keeping a close eye out for moisture and rusty nails. 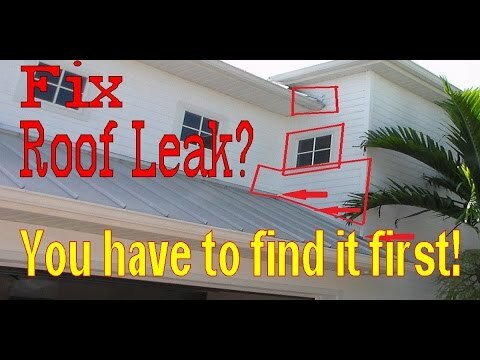 This video is the War and Peace of its subgenre, but it’s useful to watch the roofer take care of the entire process from finding the leak to fixing it. Applying a short-term fix to a few broken shingles, like this fellow had to do when a tree fell on his roof, is probably easier than you think. … Be warned, it’s not a great idea, but it can be done as long as the weather is dry and not too windy. 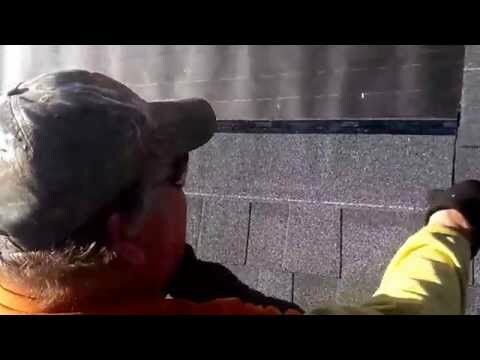 The below video shows a roofer installing shingle in 8 degrees Fahrenheit (-13 degrees Celsius) weather; as commenters noted, if you’re installing shingle in weather colder than 40 degrees Fahrenheit, you’ll need to hand-seal the shingles with roof cement, adding a dab in each corner in addition to the manufacturer’s adhesive. You’ll also need to keep shingles in a warm place (ideally near a kerosene heater) until just before you nail them in, to help reduce breakage and brittleness. Since shingle is particularly slippery in winter, it’s even more important than usual to use a harness in case you’re wrong-footed. Check your manufacturer’s instructions for the correct pattern to use to ensure the gaps between shingles are lined up correctly. As a bonus, here are some clear instructions on the most controversial roofing debate there is: where and how to nail shingles to the roof.